There is a direct correlation between body weight and premature mortality. The more overweight you are, the greater your chances of an early death. Just let that sink into your head, and you will begin understanding why you should be shooting for an optimal goal weight. Most people begin to gain several pounds a year in early midlife and, before long, add twenty, thirty, or more pounds without giving it a thought. You become accustomed to that extra fat around your waist because everyone else your age has it. Then one day you realize you have had to increase your pants’ waist size by several inches. You didn’t think too much of it, but now you know that adding those extra pounds is significantly increasing your odds of developing high blood pressure, diabetes, and heart disease. You don’t want to increase those odds, especially since you are only twenty or forty pounds overweight and have never even thought about the health consequence of that extra weight. The truth is that if you understand the damage you are doing to your body, you most likely will do something about it. If I asked a hundred people if they think smoking lowers a smoker’s life expectancy, probably 99 percent would agree that it does. Yes, I have talked to individuals who still don’t believe smoking causes lung cancer, but almost everyone knows the dangers of smoking. You know if you smoke you are cutting years off your life, not to mention the quality of the years you do live. I don’t think anyone would argue that point. Medical statistics prove these ideas. So let’s compare these negatives of smoking with the negatives of being overweight. Is being overweight just as bad for your health as smoking is? Let’s start with the effect each has on longevity. In one of the leading medical journals, the Annals of Internal Medicine, an interesting report does such a comparison. It states that being overweight and obesity in adulthood are definitely linked to an increased risk for death, as well as an increased risk for disease. They compared a normal weight group with an obese group to find the life expectancy of each group. They found that obesity results in 5.8 years loss of life expectancy for males and 7.1 years for females. You talk about throwing away years, being overweight or obese does just that. The next time you see an obese individual walking around the mall, remind yourself that their extra weight is costing them six to seven years of their life. That statement makes you wonder why anyone in the whole wide world would continue smoking, doesn’t it? However, don’t be too critical, because you may also wonder why in the world anyone would continue being overweight. Another statement: smoking accounts for at least 30 percent of all cancer deaths and 87 percent of lung cancer deaths. That statement also makes you wonder why someone who smokes wouldn’t do something to take care of that danger. Could being overweight be a comparable danger? One last fact about smoking: smoking is a major cause of heart disease and cerebrovascular disease—strokes. That statement is talking directly about the arteries of the heart and brain. It would make “walking-around-sense” to quit smoking, wouldn’t it? It is very easy to think someone ought to do every- thing they can to quit smoking after knowing all those facts. But do you think it would make similar sense to get to an ideal weight if you read studies showing that being overweight and obese is similar to the hazards of smoking? If you can realize how bad smoking is for someone else’s body, why not acknowledge that being overweight and obese is just as bad for your body—and wake up and do something about it? Obesity lowers the “hero” HDL Cholesterol by 20 to 30 percent This statement is eye-catching, especially after learning how important HDL Cholesterol is in protecting your arteries and preventing the aging process from occurring. Obesity lowers your good cholesterol by 20 to 30 percent. When you take that figure to heart, the Prescription for Life plan becomes easier and easier to follow. But the story gets even worse: Obesity can raise the “lethal” LDL Cholesterol by as much as 50 percent. 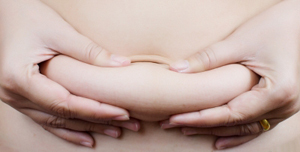 The bottom line is that you don’t want to carry any excess weight around on your body. So how do you shed those extra pounds and keep them off? 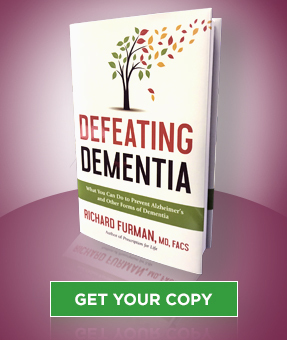 Discover Dr. Furman’s eating and exercise plan that really works in Prescription for Life. 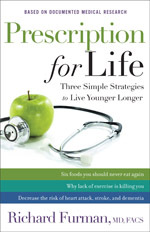 Learn how to live younger, longer and avoid major diseases later in life.